Reduce, connect and add value. - nexxar lab. - nexxar lab. Reduce, connect and add value. Digital trends in Corporate Responsibility and Integrated Reporting. Online sustainability and integrated reports provide a lot of room for creative ideas on how to present, connect and explain important topics and standards, e.g. business model, value creation, SDGs. Thus, the internet is gaining even more in importance in its role as a publication channel. Learn more about the possibilities, recent trends and conceptual challenges that come with central topics from sustainability and integrated reporting. Digital reports should offer solutions to reduce the enormous complexity of corporate reports. This is one of the most important advantages of an online report compared to a PDF or printed report. They don’t have to show all content at a glance! Online reports make it possible to easily present information in as much or as little detail as possible. Another reason why online reporting is perfectly suited for integrated and sustainability reporting is the connection of content via cross-linking. While in traditional reporting the individual sections are often disconnected from one another, integrated reports and sustainability reports often aim to link such content, thus revealing interdependencies or showing the “source” of information or additional content. And the third aspect could be summarised as “added value”. This is important, whenever we talk and think about solutions for digital reports. Does an interactive graphic or a technical solution add value? For example, does the solution have the power to engage users? Does it enhance the information quality etc.? Keep these criteria and questions in mind, when you think about the following best practice examples. For this article we have split the examples in different categories. One of the greatest challenges in corporate reports is how one can provide the diverse stakeholders with the information they are looking for. How can you break down this huge amount of text into the relevant bits, that the user is searching for? 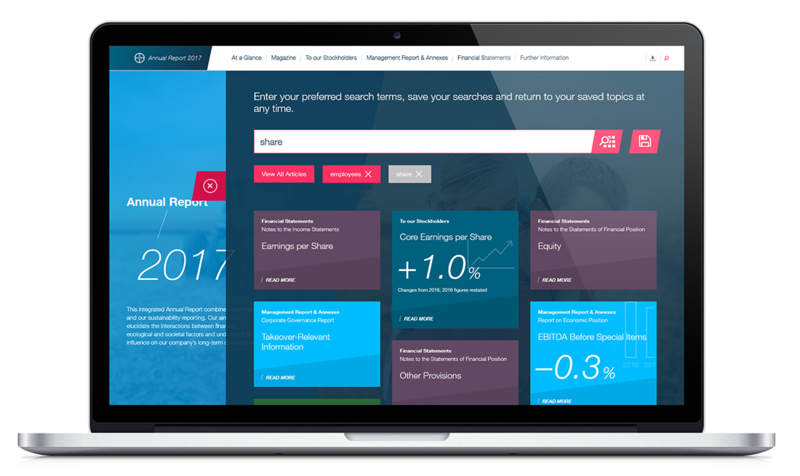 Bayer, for instance, offers an augmented report version online which has around 350 pages. That’s around 150 pages more than the printed version. That’s why we came up with an idea for an enhanced search function, which we call the “Quick Finder”. 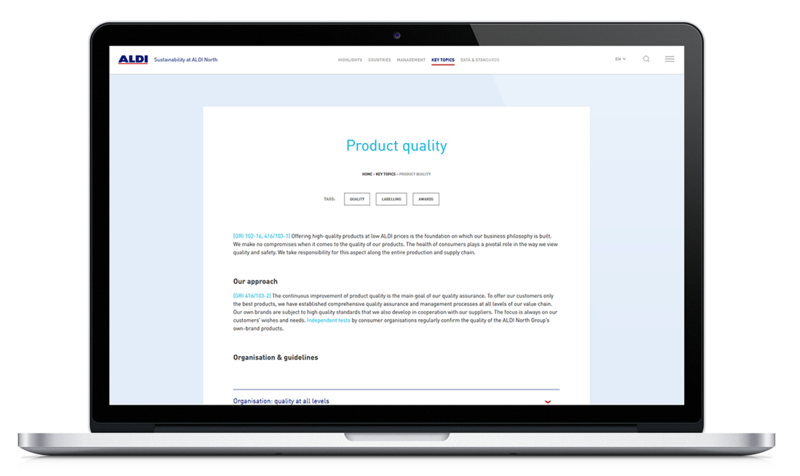 It allows for a personalised search, so users can sort the entire report’s content to find the most relevant information to them. They can save their own search queries and thus create their own kind of tagging system. You can save and switch between different search results; search results are ranked by relevance. The search is relevance-based, meaning that the whole report is being scanned for the search term, and pages where the term appears most often (or appears within headlines), will be ranked higher. Some highlights and important key figures have their own teasers that lead to the corresponding pages. The different chapters are also coded by colour. There are a lot of other ideas on how companies try to improve the accessibility of their online report. Aldi North, for example, is using tags on each page of their Sustainability Report. If you click on a tag, it is triggering the search function and shows you relevance-based results on where else in the report you can read something about this topic. Or have a look at the report from Deutsche Telekom. 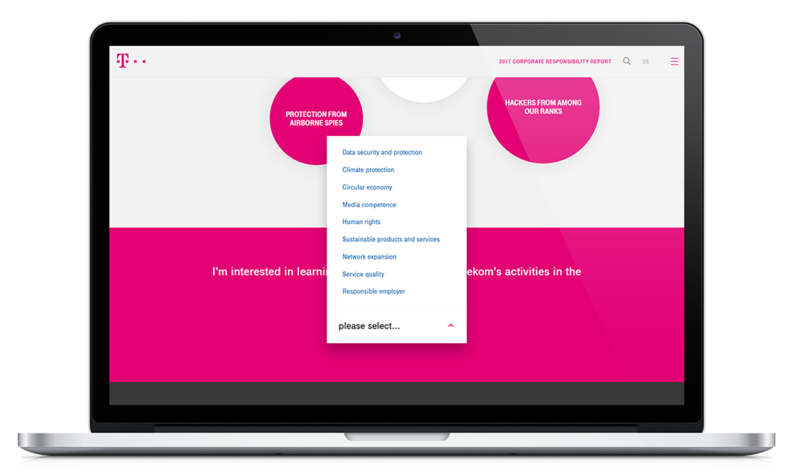 At the end of each page Telekom offers a navigational element – a drop down – where you can choose an alternative access into the report by topics – in addition to the classic main navigation. The important thing here is that if you click on one of these topics, you get to a page where all the relevant contents are collected from throughout the report – for example “Human rights”. 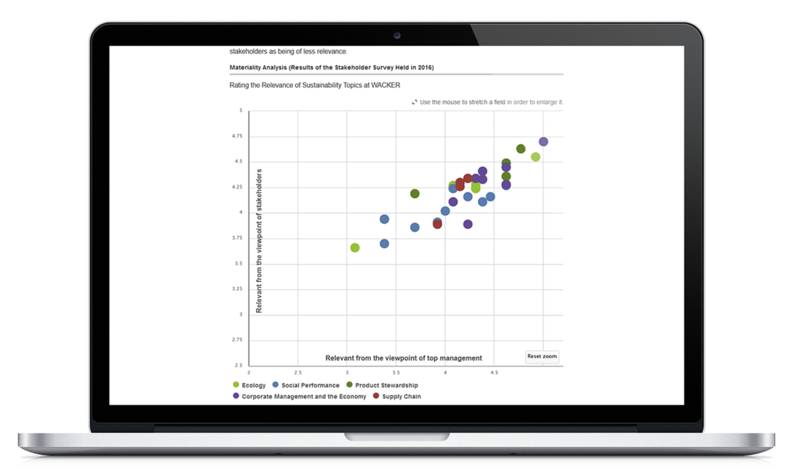 For both – integrated and sustainability reports – the materiality analysis has a key role. Materiality forms the conceptual bedrock of corporate reporting, yet no authoritative definition of it exists. Each organisation has to define by itself which matters substantively affect its ability to create value on a short, medium and long term basis. That’s why it is so important to make it transparent. This is what a materiality matrix normally looks like: it’s a static coordinate graphic with lots of bullets inside. Danone clustered the most material topics in 4 categories and used colour-coding to make this visible. It’s easy to see which topics are most material. However, it’s not easy to see which topics, for example, are connected with which field of action. Furthermore, this graphic is an information overload. 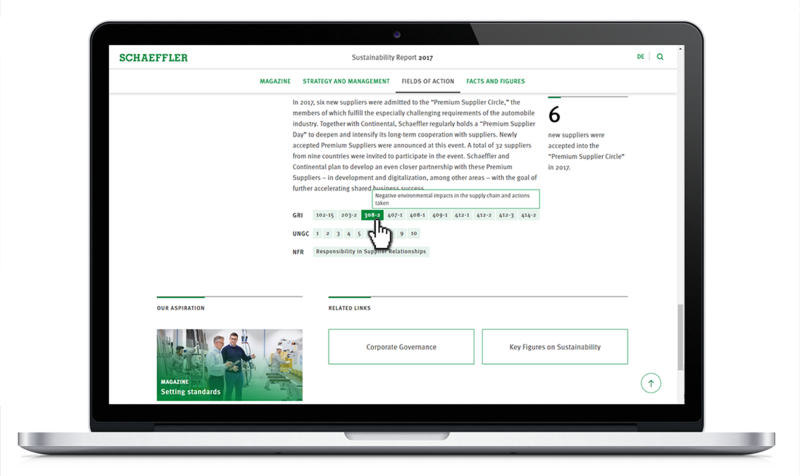 Compared to this Wacker offers two interactive versions in its sustainability report – an interactive matrix and an interactive tile graphic, which resorts the topics using filters. The next examples are about connecting content. By means of cross-linking, companies can increase the level of transparency of their online reports. In integrated reports links can also show interdependencies between social, ecological and economic reporting factors. There is quite a lot of potential in terms of content connection – BASF or Bayer are just two best-practice examples with more than 1,000 links within their respective online reports. Reporting standards such as GRI and SDG are based on the idea of connectivity and thus offer great hyperlinking potential: while the GRI Content Index, for example, usually refers to the pages that cover certain GRI indicators, online reports can also reverse this procedure. 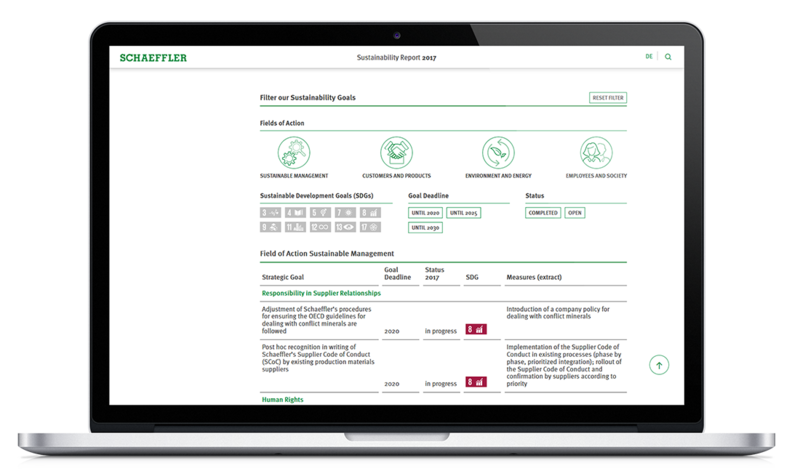 Have a look at the Schaeffler sustainability report. The single pages within the online version contain a lot of “meta information”. You will find references to the relevant SDGs, GRI indicators, UNGC priciples and standards of the non-financial declaration on many content pages. On hover, you will see the name of the specific indicators. On click, you will get to the source of information (e.g. the GRI index). Nobody needs to add the relevant GRI indicators page by page manually. They are automatically extracted from the GRI Content Index. A mouse click on the indicator directs the reader straight to the GRI Content Index and provides additional information. The SDGs are becoming increasingly important in corporate reports. Some experts even say that the sub-goals behind the SDG have the potential to replace GRI as a leading standard. Why were the SDGs identified as relevant? What is the relation to the SDG (positive & negative)? What are the specific targets for the SDGs and what progress was made? What is the company’s approach to manage impacts related to the SDGs? But up to now we don’t see a single company which can say that it really answers all of these questions in their report. So you see, there is a lot of unutilised potential and we are still at the beginning of SDG reporting. In online reports, you will find a lot of simple solutions to show the contribution of specific projects. 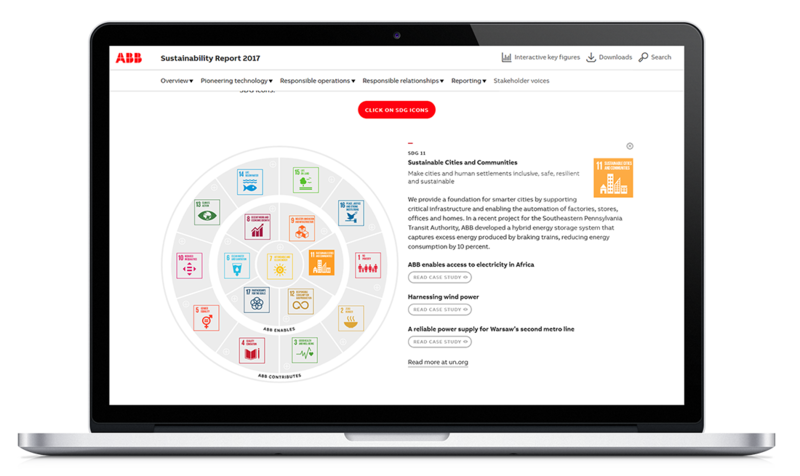 In the ABB Sustainability Report we implemented a simple interactive graphic, showing the SDGs and – on click – it offers information about the contribution of specific projects to the relevant SDGs. A way to further enhance the interconnection of this information would be to also show the relevance of contents on a specific page for the SDGs. Schaeffler goes a step in this direction within its Sustainability Report 2017. On the one hand they show the relevant SDGs on the specific pages of their report. On the other hand they integrated the SDGs into their Sustainability Roadmap. According to the International Integrated Reporting Council (IIRC), integrated reporting in particular should provide insights into the organisation’s strategy and how this relates to the organisation’s ability to create value. In printed reports, this very complex matter of value creation is often presented in large and complex infographics. Online Reports – in comparison – can offer new and interactive ways to transform this information into interactive infographics. The Clariant Integrated Report opts for a presentation approach that focuses on value creation. 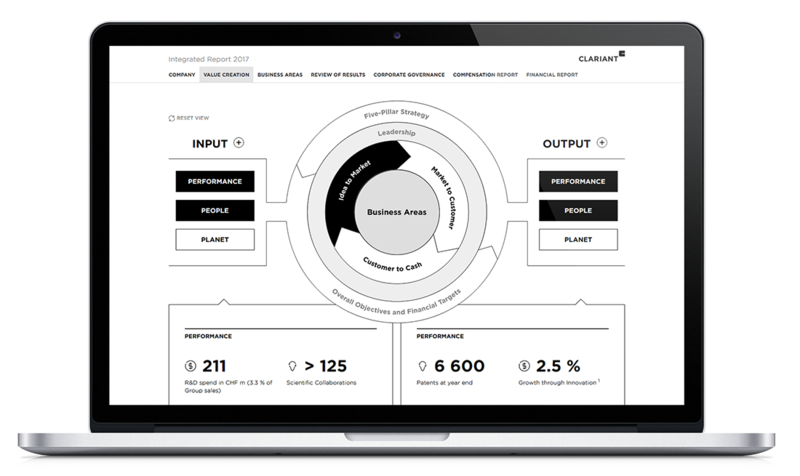 The interactive graphic directly interlinks the resources Clariant uses, the business model and the created value. Clariant clusters economic, environmental and social inputs and outputs. The figures in each section can be compared and combined individually. The capitals are marked by an icon. You can find other interactive solutions for this in the Online Reports of BASF, Philips or SAP.